The Pinot grigio is almost finished flowering (as is the Orange muscat and the Syrah). The Cabernet sauvignon is a bit of a late bloomer, literally. Our clone 4 is a slow starter and is probably only half way into bloom. The Pinot grigio fruit set looks good, aided by the fact that the weather has co-operated during bloom, no rain, no high winds. The flowers were left in peace to do their little self-pollinating thing. Vinomaker will be happy that he has plenty of white grapes to play with this vintage. I spent most of the day in the vineyard performing, what my professor at the college would call, spring viticultural operations. I call it back breaking work: suckering extraneous shoots from the trunks of the vines and stuffing wayward shoots into the trellis wires. The rows really look pretty when you are finished, but that's really not the point...unless you are a girl. I also trained up some baby vines. Can we all say, ahhh. I had field budded some vines last September and now it is time to train them up a stake and watch them mature into wine grape bearing adults. Sniff. Brings tears to my eyes, or is that my back aching? 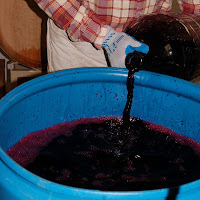 Cold stabilisation is an important step in the process of winemaking. It is the means by which the excess tartaric acid in wine is precipitated out as potassium-bitartrate salt. Tartaric acid is very soluble in wine, it's less soluble mono-salt, potassium-bitartrate preciptates out in an effect known as 'salting-out'. This lowers the total acidity, and alters the final pH, of the wine. Now some people may like wine diamonds in their glass, but most consumers prefer a little less crunch in their wine beverage of choice. The purpose of potassium-bitartrate stabilisation is to prevent the crystallisation of the tartrate in the bottle. This is a 3 week long operation at the winery with the tanks being frozen down to 27F, resulting in a good half inch of ice on the outside of the stainless steel. Additions, in ppm, of isinglass and bentonite aid in the fining process which produce a beautifully clear wine that is however still rich in ML bacteria...on to the filter. On a 90F day, like it was yesterday, I try to find any excuse to be in the tank room so that I can give a frozen tank a hug...even if it does contain Chardonnay! Here he is, Vinomaker...making vino. Actually, he is just racking it; pumping the wine out of the barrel, cleaning the barrel and putting the wine back into the barrel. It's not a fun job but it is essential. We were at it all day, it was tiring but there are worse things you could do on a Sunday than stand around and smell great wine (in this case a Syrah, grown by me), for 7 hours. I had a beer with dinner! Yesterday was an exhausting, but exciting day. It started with a beautiful, new life and ended with me being separated from my luggage. Strolling around the vineyard this morning, observing the Chia Pet like growth of the vines (in my 2 week absence), I noticed this feat of engineering. 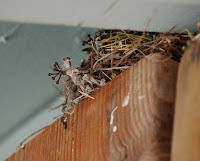 There are many bird's nests around the house and vineyard right now, but this one, tucked up under the eaves of the barn, caught my eye. Our industrious feathered friends are generally ingenious in their choice of nesting materials, but this little opportunistic twitter had chosen discarded grapevine rachises to underpin the structure of her domicile...or maybe it was meant as an aesthetic, architectural statement. The last day of my holiday arrived. 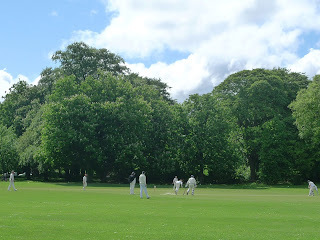 It was an all round good day; had a leisurely stroll in the park, watched a cricket match, ate Scouse for dinner, had some relatives stop by to say cheerio, and watched the Eurovision Song Contest. A very English day. The main reason for my trip home was the expectant arrival of a new niece. For two weeks I asked my sister-in-law, several times a day, if she was having any twinges, but nothing...howzat! I had insisted on a fine bottle of something bubbly from Thud's cellar after dinner as I was determined to wet the baby's head, even if she was refusing to come out and meet her auntie Vinogirl, before I jetted off. It turns out I wasn't disappointed after all. I had 45 mins with the 40 minute old little darling before I was driven to Manchester Airport. I was happy to see Common Vetch growing vigorously on my recent ramble with Thud. It made me think of my little vineyard almost 6,000 miles away. Of course, the entire state of California won't be looking quite as green as this right now as they are having slightly higher temps than Blighty. You also won't see the Common Hawthorn (Crataegus monogyna) growing alongside the vetch stateside. How English! Oh dear, it's a shame when a fairly expensive wine does not live up to expectations. The Bouchard Pere et Fils 1996 Puligny-Montrachet was one such wine. I get excited to have nicely salted and vinegared fish and chips when I get home to England, accompanied by a pleasing glass of wine. I usually prefer the vinegar be on my chips as opposed to in my glass, call me old fashioned, but a glass full of vinegar I did indeed get with this one. Hate when that happens. Tonight, we had a belated birthday celebration for a good friend. Quite a bit of wine was consumed. Although the wines we drank were mainly of the Napa and Sonoma persuasion, the birthday boy himself, Lord Roby, contributed a bottle of something special from his own cellar. The 1999 Chateau Cantemerle was quite enjoyable. Not a complex wine, at best medium bodied, but pleasant in its tannin structure, with well integrated oak, and a nice cassis-leather-cedar-roasted nut, flighty smoked meat nose. Naturally, as I expected, there was quite a bit of barnyard present that even the non-wine drinkers at the table could detect. Now and again I like a little bit of Brettanomyces in my wine, it can add a bit of character: too much can be another matter. Thankfully though, it blew off after a good swirl. This wine would probably had been even better with food. I have always loved wines from the Medoc. I enjoy the complexity the coastal climate lends to the finished wines. I think the main reason I love Napa and Sonoma viticulture so much is the similarity in proximity to the coast and the marine influence on the maturing fruit. We are saving the Madeira for tonight...phew! 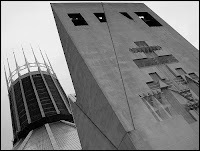 I attended mass at the Metropolitan Cathedral of Christ the King this morning. Replete with smells and bells it is the the best show in town on a Sunday morning. The choir was in fantastic form singing the Creed in Latin, their voices reverberating in the ether long after the last note was sounded. Great stuff. God continued to show he has a sense of humour as the entire mass was vine themed thanks to a preponderance of references from the book of John in the hymns, readings and even the Gospel. He must have known I was visiting from Napa. Went on a hike today in Thurstaston on the Wirral, a peninsula across the River Mersey from Liverpool. It was extremely windy and Thud and I got beat up by it. We stopped for a Mars Bar break on a bench with a fabulous view of the Dee Estuary with the sunny Welsh hills beyond. England never looked so lovely to me; pheasants meandered in a field below, swallows bobbed and weaved overhead, cows lazily munched their way over the extremely close cropped grass in a nearby pasture, and a small brook babbled in the background. I commented on how green and lush the grass was and how silly I thought it was for people to have lawns in California. Thud agreed and said how he quite liked the landscaping style a lot of Californians are now leaning towards of native, drought tolerant plant species, adding that it would be like planting a vineyard in the field in front of us...then having to build a greenhouse around it. Rain threatened a little so we continued on our trek. With the parish church of St. Bartholomew coming into view, we knew that we were close to the end of our walk. It was then that we noticed, as we looked across the estuary to see if Wales was still bathed in sunlight, something very familiar, to me at least, on the horizon that we had not expected to see: a vineyard. We climbed over the gate that led to the field of vines to get a closer look. Indeed, it was a vineyard of only about 2 acres, I would suppose, but a vineyard none the less. We were both stunned. It seemed so out of place. I have been home for a week now and have seen the sun for at most a few hours, total. Unless these vines, whatever varietal they are, have the ability to ripen in tundra like conditions they are going to produce grapes with some seriously high acid. I do not think the cultivation of vines in more northerly areas is an indication of global warming. Instead, it is more likely that new hybridised varietals are being produced that are more cold tolerant and less sunlight needy. At least that's what I believe as I sit here with a woolly jumper on, getting paler by the second and in desperate need of a mug of hot chocolate. Oh, to be in England now that May is here! Went out shopping with the family today, we decided to go to a nursery. The weather was OK, no rain but lots of wind. 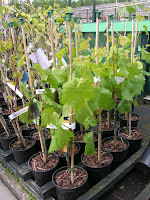 Of course I had to go and take a peek at the vines that were being offered for sale. All the vines were Vitis but no recognisable wine varieties. Thud decided to purchase a Regent grapevine, a dark skinned variety that apparently can be used for wine production, or as table grapes. He's not going to get much wine out of one plant, but it's a start. Thud makes great cider though, so perhaps he should leave the winemaking to Vinomaker. The sales and marketing team and the quality control crew at Ravenswood would probably be slightly perturbed on spotting this little labelling faux pas on the shelf at Tesco. Yes, I was there once again hoping that somehow their wine selection had miraculously improved over night! As much as I love Tesco, and I do, their selection of USA wine leaves something to be desired. I almost get the feeling that there is some sort of prejudice against American wines, especially Napa as there are a couple of Sonoma wines featured. It's not as if Argentina, Australia, and Chile, who are all well represented, are closer to Blighty than the United States and it's a shipping and logistics issue. Also, they are obviously not members of the European Union. It cuts both ways I suppose: I have had Americans tell me that the English only drink cheap wine. After being initially insulted I have to admit that a visitor, from any wine producing region of the world, would pity the poor Englishman's taste buds after witnessing the choice of Californian wines available to him. Move over Auction Napa Valley. To think I moved all the way to the Napa Valley to be in the wine industry. I could have just stayed at home and been a part of Tesco's Wine Festival every year. The 2009 Tesco bacchanalia of half price bingeing is under way. There is no celebrity host at this event, no Jay Leno, no Ryan Seacrest, so Auction Napa Valley does not have to worry about the competition. The wines may be half price but I don't think I will be buying any of them: the selection is disappointing. I'll just try a couple of older things from Thud's cellar. Of course I have an aversion to most of the over priced cult wines in Napa too. I am so hard to please! I think I will just drink something I like, not something someone tells I should like because the price tag deems it so. ...to where I once belonged. Today I am going home. Not that I'll be missing much weather-wise in Napa, it poured down all day yesterday. It was OK for me, I finished my English homework, ran some errands and packed...but the poor Vinodogs were bored stiff. They much prefer bouncing around in the California sun, chasing lizards and what not. V1 is rather attached to me. Last time I left for a fortnight she barely ate the entire time I was gone. That makes me sad even though I am excited to go home. The wine is packed (a nice selection for Thud), the case is zippered and my passport is in my hand.